​Being one of the oldest cities of the New World, San Juan has developed a strong survival instinct and adaptation skills. This idea is best represented by the interesting marriage of the colonial Old San Juan closely linked to the modern business towers and large beachfront hotels. 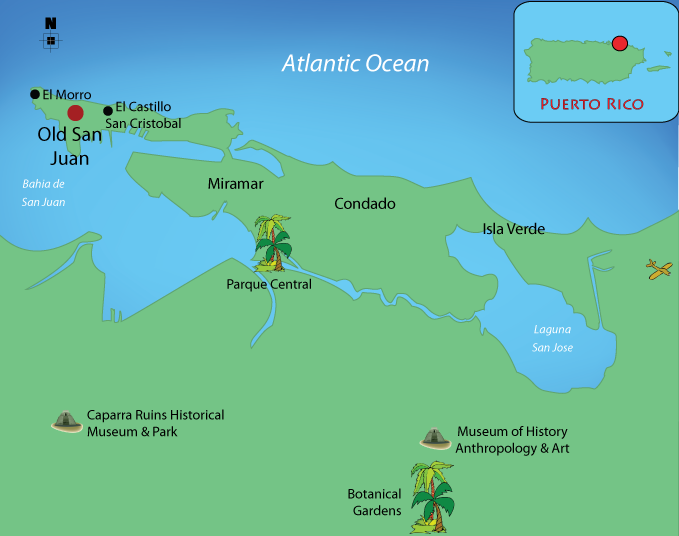 Being one of the oldest cities of the New World, San Juan has developed a strong survival instinct and adaptation skills. This idea is best represented by the interesting marriage of the colonial Old San Juan closely linked to the modern business towers and large beachfront hotels. Today Old San Juan is home to many attractions, churches, museums, restaurants and shops. It is a great place to spend the day, strolling about the narrow streets. Otherwise, the beaches, along with most water sport complexes and resorts, are located on the coast by Condado and Isla Verde. San Juan truly offers the best of both worlds.